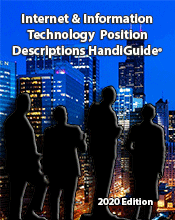 The author of this book has extensive experience in job content definition and analysis. He personally is recognized by the courts as an "expert" and has been used by a number of firms as an expert in age and job discrimination cases. The HandiGuide includes some of the tools that he uses in that process. 4th GL Specialist, 4th GL Specialist Senior, Account Representative, Accountant, Accounting Analyst, Accounts Payable Clerk, Administrative Assistant, Audio Visual Technician, Business Analyst, Business Services Analyst, BYOD Support Specialist, Change Control Analyst, Cloud Computing Architect, Competitive Intelligence Analyst, Computer Equipment/Network Analyst, Computer Operator Junior, Computer Operator, Computer Operator Lead, Customer Account Manager, Customer Service Coordinator, Data Analyst, Data Center Facility Administrator, Data Entry Clerk, Data Security Administrator, Database Specialist, Desktop Specialist, Desktop Technician, Disaster Recovery Coordinator, E-Commerce Specialist, Enterprise Architect, Enterprise Resource Planning (ERP) Architect, Enterprise Resource Management (ERP) Business Analyst, Enterprise Resource Planning (ERP) Data Architect, Enterprise Resource Management (ERP) Decision Support Analyst, Enterprise Resource Planning (ERP) – Developer, Enterprise Resource Planning (ERP) Functional Lead, Enterprise Resource Planning (ERP) Infrastructure Administrator, Enterprise Resource Planning (ERP) Master Data Analyst, Enterprise Resource Planning (ERP) Process Owner, Enterprise Resource Planning (ERP) Security Administrator, Enterprise Resource Planning (ERP) Security Analyst, Enterprise Resource Management (ERP) Subject Matter Expert, Enterprise Resource Planning (ERP) Team Lead, Enterprise Resource Planning (ERP) Technical Lead, Enterprise Resource Planning (ERP) Trainer, Executive Secretary, Forms and Graphics Designer, Hardware Installation Coordinator, Help Desk Analyst, Help Desk Technician, Human Resources Generalist, Human Resources Specialist, Internet Developer, Internet/Intranet Administrator, Information Technology Associate, IT Planning Analyst, Key Performance Indicator Analyst, LAN Applications Support Analyst, Librarian, Maintenance Contract Administrator, Media Librarian, Metrics Measurement Analyst, Network Administrator, Network Control Analyst Assistant, Network Control Analyst, Network Engineer, Network Security Analyst, Network Services Administrator, Network Specialist, Network Technician, Network Specialist Senior, Object Programmer, Object Programmer Senior, On-Line Transaction Processing Analyst, Operations Analyst, Operations Analyst Senior, Operations Training Coordinator, Pandemic Coordinator, PCI-DSS Coordinator, Personal Computer Specialist, Planning Integration and Control Administrator, POS Coordinator, POS Hardware Coordinator, POS Senior Coordinator, Print Operator, Procurement Assistant, Procurement Coordinator, Production Control Analyst, Production Control Analyst Senior, Production Control Specialist, Programmer/Analyst, Programmer Assistant, Programmer, Programmer Senior, Quality Measurement Analyst, Software Engineer, Software Quality Control Tester, Staff Accountant, Systems Analyst, Systems Analyst Senior, Systems Integrator, Systems Programmer, Systems Programmer Senior, Systems Support Specialist, Systems Support Specialist Senior, Tape Librarian, Technical Services Specialist, Technical Specialist, Technical Specialist Senior, Telecommunications Technician, UNIX Programmer, UNIX Programmer Senior, Voice Communications Coordinator, Voice Communications Specialist, Voice Wireless Communications Coordinator, Web Analyst, Web Site Designer, Wireless Coordinator, Word Processing Operator, and Word Processing Lead Operator.